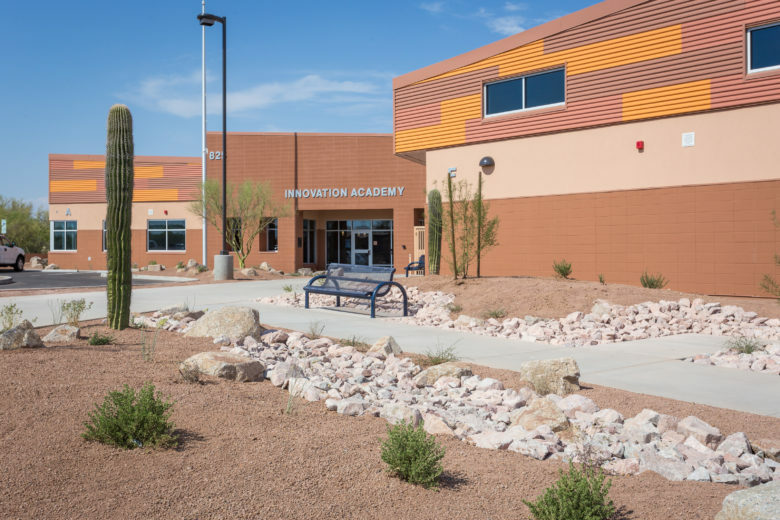 The Amphitheater School District employs STEM concepts throughout the District, but there was a strong desire to construct a new school designed around a STEM focused curriculum. District personnel, parents and business leaders in the Technology industry worked together to create a vision and educational specification for this school. Students are organized into 3 learning communities, young, middle and older. The young community learning labs are large in size and provide space for varied group and individual activities. The middle and older student communities have 6 learning labs and 1 project maker space. The central breakout area provide activity kiosks. Each community has an outdoor lab with water harvesting and project areas. The student commons building has music, art and tech labs, dining / presentation and library functions. This entry was posted on April 3, 2018 by swaim_admin.